The prickling heat is on and it is not going anywhere anytime soon. Welcome to Summer, 2016! You can freeze grapes, olives and lemon ahead of time and then use it to chill your wine without watering it down or throw other frozen fruits in your water for an awesome chilly fruity flavor to quench your thirst. Another great hack is to freeze your coffee or tea (making tiny cubes out of them) and then put the coffee or tea cubes in a glass if you are ready to drink. It’s a great way to prevent them from watering down as you maintain the quality of the flavor and the coldness. 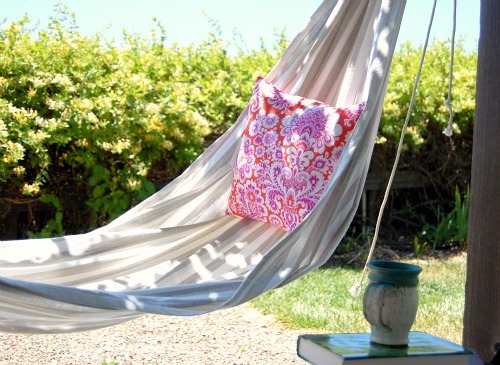 If you want to stay outdoors to relax and enjoy a good book to read in your backyard, then you can use your spare blanket or a big piece of cloth to make your own instant hammock. Just make sure that you use a sturdy rope to wring the ends, a sturdy blanket to support your weight and of course a safe place to tie your DIY hammock to prevent you from falling. 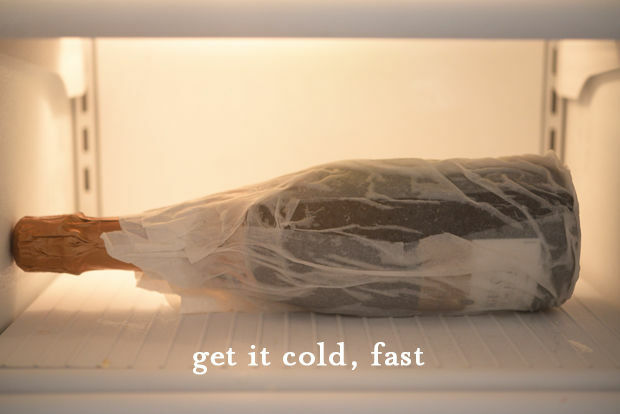 One great hack to easily freeze your bottled drink is to wrap a wet paper towel and to put it in the freezer for an instant chill. Another way to instantly cool a warm soda or drink is to submerge it in a bowl of ice water, with a pinch of salt and it will immediately drop several degrees in just a couple of minutes. A bit of chemistry definitely helps! Too lazy to get out of the pool and fetch yourself a chilled beer or iced cold drink? Then make your own DIY Floating Bar! 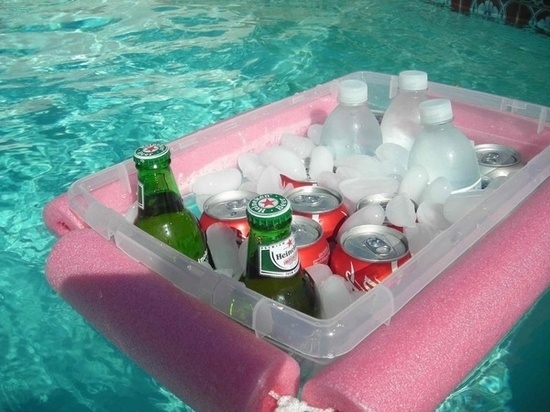 All you need is a wrap pool around a plastic chest or a tub full of ice, beers and drinks. This is very convenient for a fun pool party or family pool bonding. Well, wearing a heavy makeup can be a bit inconvenient during summer. And sometimes applying sunblock or sunscreen can turn your face into a Kabuki actor because of the typical white pigment formulation. So if you are to hit the beach or just want to have a simple daylight makeup, opt out the heavy foundation and make your own Tinted Sunblock for lighter, natural coverage, instead. All you need is your favorite sunblock or sunscreen (preferably with a higher SPF), your mineral powder foundation, an empty container and something to stir them together. You have the control if you want a larger portion of the sunblock or you want to add more powder foundation to come up with a more tinted formulation. You just have to mix them together thoroughly until they blend well and then to put it in an empty jar or container. It is daunting to go out and to stay fresh during summer. Perspiration is inevitable, so as body odor. One way to keep your fragrant last in your skin is to rub a portion of Vaseline on the identified body pulse points before spraying your perfume or to apply unscented lotion if you don’t have Vaseline to make the scent last longer. This definitely will save you from spritzing your perfume over and over the entire day. Summer heat can make your hair super greasy and smelly. And concealing those oily strands can be a bit challenging. Dry shampoo is often the solution for this issue as it absorbs the oil that’s lingering on those unwashed roots for an instantaneous result, although dry shampoo is a bit pricey. All you need is to mix together in a bowl. Cornstarch is the actual base which greatly absorbs the excess oils from your scalp. The cinnamon acts as the anti-bacterial which also provides healing properties and the essential oils gives the fragrant scent and help to stimulate your scalp. 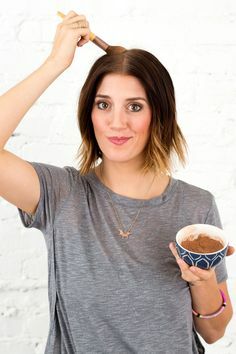 If you have observed, we only added unsweetened cocoa powder for the darker shade of hair (the only ingredient different from the mixture for lighter hair shade). This makes sure your hair smells nice and fresh at every application especially if taking a shower is not an option. Deodorants, especially deo-sticks are effective to combat perspiration and nasty body odor. To prevent your underarms from sweating, wash them every two hours, pat them dry and then apply a fresh coat of your deo-stick or deo spray. Do not re-apply it when you are all sweaty, else it will not stick on your skin and putting it on is just a waste. The secret is to make your skin clean and dry for the deodorant to stay longer. Nevertheless, another interesting hack to make your deodorant stay longer is to apply toothpaste (pea size) on your underarms while you are taking a bath. Leave it on for several minutes and then rinse your underarms completely. Once you apply your deodorant, it keeps you feeling fresh by preventing body odor for practically the whole day. If you’re not comfortable with the toothpaste, you can apply powder on your underarms instead after applying the stick deodorant. It gives you the same effect of longer lasting freshness. One annoying aftermath of heading the beach aside from sunburn is the sands that stick in your car and your carpets at home. So to prevent yourself from bringing home the beach sands that cling on your feet, arm yourself with baby powder! By sprinkling baby powder on your sand covered feet, the sand will easily fall off. It is a cheap alternative to remove and dust off sand easily, plus it works pretty well. Summer is actually the coolest season of the year, only it is hottest (if you know what I mean). You have plenty of time to do fun outdoor activities. But of course, it is more fun if you are armed with a lot of practical summer hacks, not only to alleviate the heat but to survive the challenges of this season as well. Let not heat stop you from having the best summer experience ever. Have an awesome summer!